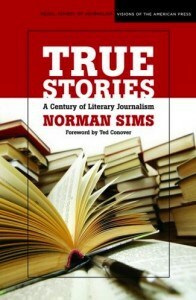 This introduction was based on interviews with several literary journalists. They discussed their approach to literary journalism, which collectively almost forms a definition. 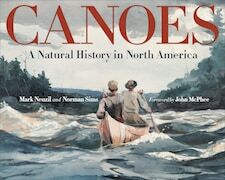 Canoes: A Natural History in North America, by Mark Neuzil and Norman Sims. Foreword by John McPhee. 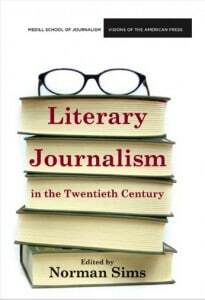 This book traces more than a century of literary journalism history, primarily in the United States, examining the cultural connections, competing journalistic schools of thought, and innovative writers that have given literary journalism its power. Included are original works by Michael Paterniti, John Dos Passos, Edmund Wilson, Joseph Mitchell, and Adrian Nicole LeBlanc that serve as examples, along with a personal foreword by Ted Conover. This wide-ranging collection of critical essays on literary journalism by several scholars addresses the shifting border between fiction and nonfiction, literature and journalism. 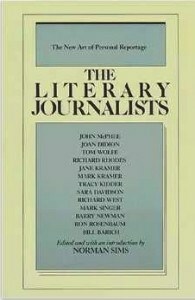 Literary Journalism in the Twentieth Century addresses general and historical issues, explores questions of authorial intent and the status of the territory between literature and journalism, and offers a case study of Mary McCarthy’s 1953 piece, “Artists in Uniform,” a classic of literary journalism. Contributors include Tom Connery, Ron Weber, William Howarth, John Pauly, Shelley Fisher Fishkin, Hugh Kenner, David Eason, and Kathy Smith. John Hartsock wrote the foreword. This anthology, co-edited with Mark Kramer, offers some of the best and most original prose recently written by literary journalists. Contributors include John McPhee, Susan Orlean, Tracy Kidder, Ted Conover, Richard Preston, Joseph Mitchell and nine more. Literary journalists are marvelous observers whose meticulous attention to detail is wedded to the tools and techniques of storytelling. Like reporters, they are fact gatherers whose material is the real world. They are consummate storytellers who endow their stories with a narrative structure and a distinctive voice. In my introduction, interviews with literary journalists conducted especially for this book show how they work and how they perceive their work. 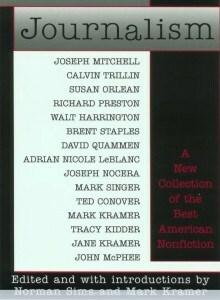 The collection includes work by John McPhee, Joan Didion, Tom Wolfe, Richard Rhodes, Jane Kramer, Mark Kramer, Sara Davidson, Richard West, Mark Singer, Barry Newman, Ron Rosenbaum, and Bill Barich.